This looks interesting. If the art style is anywhere near this and if it looks like this then I am kinda excited actually. After what we've seen from Atari and Pantera, I think that Frontier definitely did an amazing job with the reveal trailer. I have a feeling this is what the aesthetics of the game will look like, and I really like how the game is presented. Now hopefully it plays just as good as it looks. The trailer in incredible, but their site blows this thing out of the water. This is what a professionally done game looks like, this is how it should be presented, and this is the stage at when you show it. E3 the biggest gaming show of the year. Don't even care if this is wasting money, I'm buying the early bird pass. -Diagonal paths and circluar paths. Which could mean no grids? - B&M sitdown show in trailer? Anyhow can't wait to get it! This looks incredible. I need a new PC asap. I knew Frontier were working on a new theme park game - and out of everyone...I knew they'd deliver. 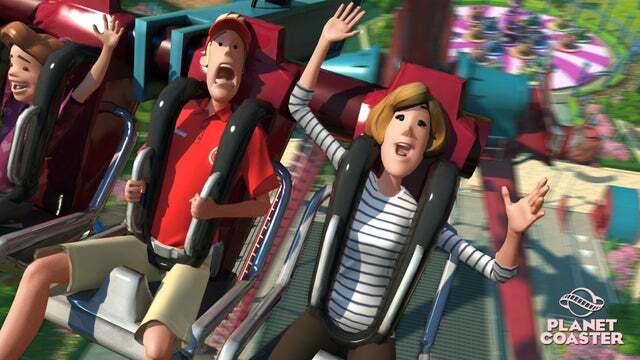 Think they've really captured the appeal of RCT3. Really exciting trailer!! The art style looks great, good mix between realistic and cartoon. If this is legit then it looks great. Incredible art style. Aha I found that file hidden on their site also. It's the background video playing on the top of their main page. I was trying to find some other unreleased pics in their files and names, but there were just copies of the ones they have already released. And we finally have an appropriate successor to the genre! Only took 12 years, but hey...who's counting? I hope that's not the actual physics... Other than that this game looks surprisingly good! Yeah, this looks amazing! I can't wait to get more information! I'm not thrilled with the idea of shelling out $75 for a beta rather than just $30 when it's released, nor for any of their multitude of 'extras'...$750 for a 'tile'?? I'm leery that Planet Coaster will resemble the Elite stuff they have...all available for a price. Otherwise it looks good. They are a bit cryptic about custom scenery and the ability to visit other parks. But I'm just not ready to jump on the fan-boi wagon until a lot more information is available. I agree 100%, It is very promising, but there needs to be a lot more information available before I can make an informed decision as to wether to get hyped. I wish Frontier the best of luck. We need a good coaster game, this seems to be it. This is where gaming is headed for better or for worse. purchasing things ahead of time or donating money via kickstarter or whatever for special 'perks' which end up as like 100% profit for the company if it's a digital thing. It makes sense business wise: if you can get enough people to finance some of the game early, it's less out of your pocket, less risk, and you end up somewhat amortizing the cost. I am this forums noob. I don't even care this game has already proven how wonderful it is by giving us a broad release video, that completely aces all the other sims recently. The fact that the models arent just images plopped at the end of a wordy vlog, and they are free for us to properly look at, is very reassuring. Can I ask, did anyone else feel like the guy in the advert was almost a representation of the community. Like, if you listen to the lyrics also, the first 8 bars along with the animation can sort of represent the neglection for the community, and how its all being drawn back... with a single tile. If this is anything as good as they've made it seem I will cry with joy. Seriously. this is it. Damn this looks good so far! Who knew haha. Considering Frontier is the one who made RCT3 I don't doubt they could make this great. Although it is so new and so far from launch which leaves too much unknown to say just yet if this is a success. They have also had a few coaster games in between to learn and their mobile game, while simple, was actually pretty good. So far Frontier has the history to backup this game. I am looking forward to see where this goes. The art style is already beautiful, can't wait to see more of the world they created. If Elite: Dangerous is any indication of the quality of Frontier's recent work, I'll definitely give this a try. The more I watch the trailer, the more tempted I am to get the early pass... I mean just look at that dinosaur mascot! It's the cutest thing I've ever seen in a park sim ever. I'm guessing these aren't the exact graphics we're gonna be seeing. I want to see gameplay footage before I get too excited. We've been teased with great renderings only to be disappointed when the final version comes out. You need to lower your standards cause it's never getting any better than this. I'm not so sure actually - with the trends in gaming these days...this doesn't look that far-fetched as an art direction! It's like Windwaker HD meets RCT3...and I'm very much on board! I'm pleasantly surprised and happy to see this come. That art style is incredible, and that dino-mascot is adorable. I may even consider the early pass, but I don't want to get my hopes up quite yet, as we've seen with past attempts at roller coaster sims... Though with Frontier at the helm of this new sim, I'm sure it'll be incredible! Believe in yourself and the rest will work out! I think this is great, from what we have seen on other upcoming or just released games this totally triumphs. Even if this game is not what we was completely looking for (which i think it is exactly what we are looking for), its going to bring the community together and finally see the rise back to the rollercoaster games. We can now start a fresh in terms of what we can do with the game, the way certain members of the community e.g iJohn reimagined rct3 into a new game. I don't think the trailer is indication of the graphic we will see but the models on sketchfab, and the video on the website, http://www.planetcoaster.com/, are entirely possible for the real game graphics. The graphics aren't going for realism so they can cut corners on some things and add details in other more important places. So an art style such as the one they chose allows for that amount of detail. Just look at The Sims 4. The in game graphics are beautiful and detailed albeit not super realistic.